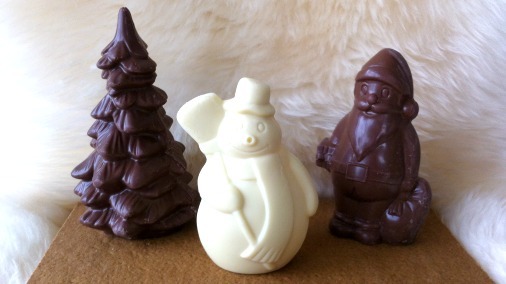 Here are my recommendations from the hugely tempting array of Christmas chocolates on offer. No more head scratching needed, my Christmas chocolate shopping recommendations will leave everyone you have to buy for feeling loved and satiated. There is something for everyone, and each year I thrill to the deliciousness and ingenuity of all the chocolate creations to be had! But before we look at gifts for others, what about advent calendars! You don’t have very long until the start of December, and there is no more surefire way to brighten your advent. If you want to buy extra and give them to others as well, that’s your call. A moment of honesty here, I simply cannot resist advent calendars, and the number I buy increases year on year. There is nothing like that first thing in the morning glum being broken by the dawning realisation that you have an advent calendar (or five) to open. A festive picture revealed is a little moment of something frivolous and happy before the day has even begun. I’m a sucker for the sparkliest, most jolly-Victorian-red-clad-Santa scenes I can find. But of course here we concern ourselves with chocolate! Friis Holm ultra-gourmet advent calendar cube. 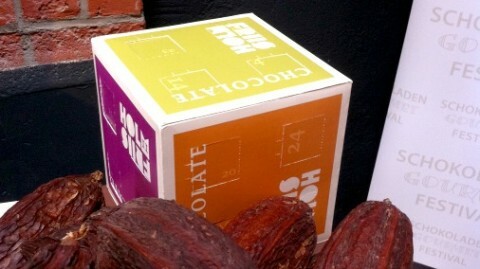 Mikkel Friis Holm, as you will know if you are a regular reader, is one of the world’s finest chocolate makers. So it is quite something special that this year he is debuting an advent calendar. Friis Holm is based in Denmark, which doesn’t make supply easy. But Mikkel has told me that he can post to those wanting to get their hands on his advent calendar in the UK, you just need to email him at mikkel@friis-holm.dk. The price per calendar is £40 (plus £14 for postage and packing, a fixed P&P price no matter how many you order). This will be the bean to bar connoisseurs choice this year for sure. Paul A Young’s divine little houses. 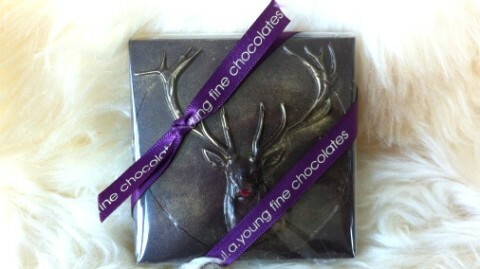 And for those who want the packaging to thrill as much as the chocolates, how about this divinely pretty and nostalgic-chic offering from Paul A Young. 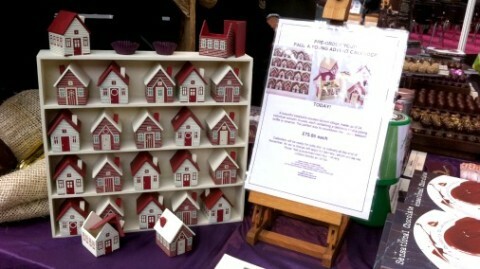 The gorgeous little wooden houses are filled with Paul’s superb truffles and filled chocolates. His new Christmas flavours are all winners (see below) and the gorgeous houses can of course charm (and be refilled with chocolates) for years to come. 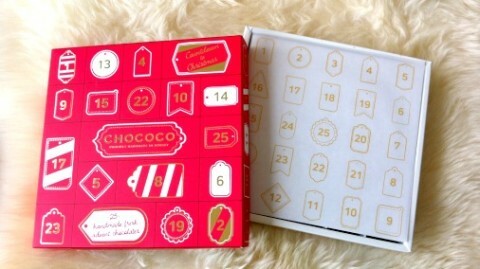 The ever wonderful Chococo calendar has a new look. 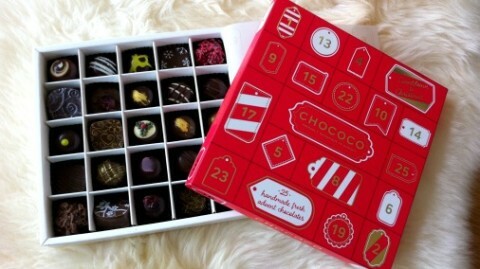 I always love Chococo’s advent selection box. This year the box has been redesigned beautifully. And behind those stylish numbers…. And the contents are as deliciously and tempting as always. There are so many favourites among these, but the gingerbread caramel, which took home a silver award in the World Finals of the International Chocolate Awards this year, is particularly special. The new R Chocolate’s DIY festive scene. 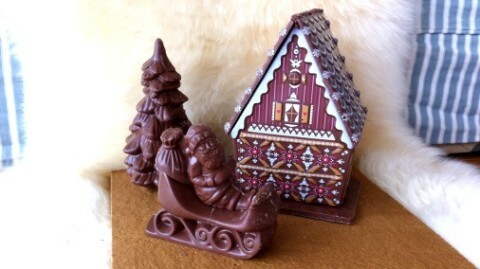 Apart from an advent calendar (or two/three/four) your house can be bedecked with chocolate decorations too! New chocolatier R Chocolate have created this DIY advent scene, with a gingerbread base on which you can place any of their gorgeous shapes. Here I have their pretty-as-a-picture house with santa, but see the lead picture of this piece for their white snowman and santa. 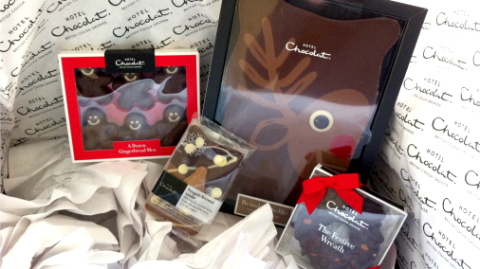 A bumper Christmas crop from Hotel Chocolat. Hotel Chocolat always have a terrific range of seasonal things, from the grand centrepieces (such as the larger size of the fine origin wreath here) to stocking fillers. The wreaths are so beautiful, and studded with the perfect amount of Christmassy fruit and nuts. And I am going to be tucking these smile-inducing gingerbread men and penguins into lots of Christmas packages. A glimpse into Rococo, whose festive gifts always are truly charming. At Rococo, Chantal Coady and her team excel at creating things that are charming, gorgeously made of chocolate you want to eat no matter how much Christmas pudding you have packed away, and with consistently delicious and interesting flavours. 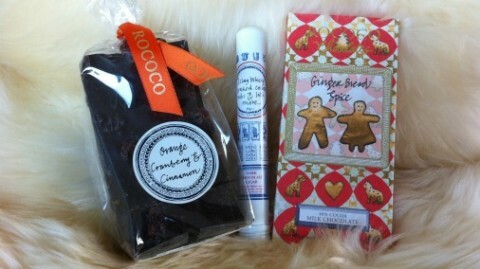 New treats and old favourites from Chococo. 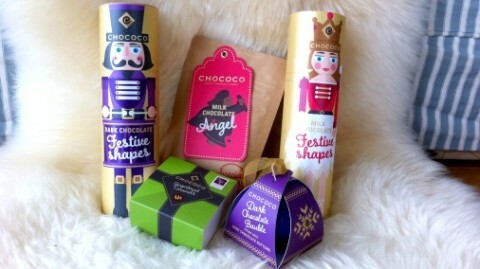 In addition to the lovely advent calendar, make sure you add some of these beauties to your Chococo order. There is a great range of shapes and options, with these lovely new lord and lady top of my list. The beautifully designed tubes contain mini figures, so lots to go around if you can persuade the lucky receiver to share. And the small green box has four of those award winning gingerbread caramels! A grown up offering from Miss Witt. Kerry Witt also has some good little presents, such as this hot chocolate stick and chocolate orange crisp shards. 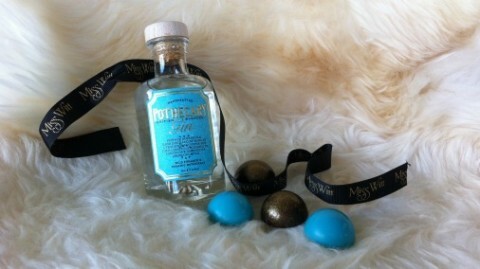 And this lovely Tiffany blue gift box contains the fruits of her new collaboration with Pothecary Gin. 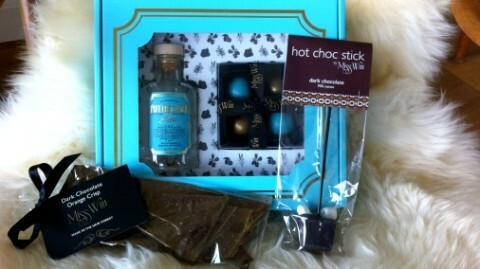 In addition to the gin are two each of the chocolates. The chocolates are not boozy, but lifted and infused with some of the distillates and botanicals used in the gin. My favourite is the dark chocolate ganache with hints of lemon zest and mulberry. Fifth Dimensions take you on a Christmas holiday. Chocolatier Fifth Dimension have rebranded their website and packaging this year; a great way to celebrate a superb multi-award winning year. This box of delights is the newest incarnation of their journey box, containing one each of their flavours themed around cities of the world. Take a taste trip round the world this Christmas, from your sofa! 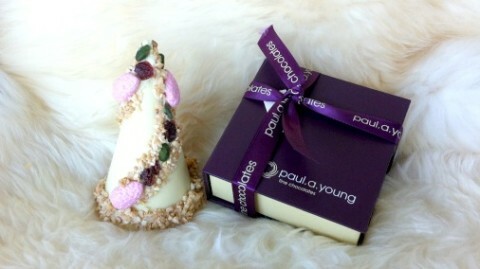 Paul A Young’s white chocolate tree with one of his signature purple boxes. 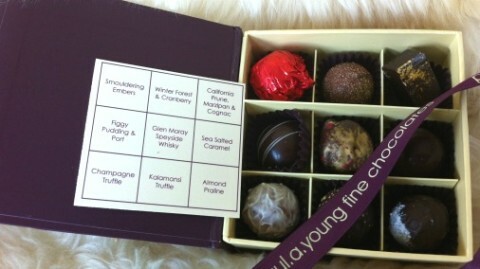 If you want a box of chocolates with Christmassy flavours, you cannot do better than go to Paul A Young. Of course the ultimate treat is to have them in the advent calendar above. But his purple boxes are uplifting too! Plus there are great other gifts, such as this treat studded white chocolate tree. How beautiful is this! Again from Paul A Young. My award for the most gorgeous mould goes to this simply fabulous stag chocolate bar, complete with red nose. It is so elegant, and with smoky flavours to complete the winter by the fireside in a country lodge fantasy. Paul’s new Christmas flavours, about to be devoured! All the Christmas flavours are wonderful; rich in winter fruits, booze, and deep dark deliciousness. Highlights include Smouldering Embers – an ultra fluid ganache with bonfire in the mix, both smoky and fruity at the same time. I also adored the Kalamansi Truffle, whose crisp dark shell contains white chocolate and kalamansi lime ganache – a great fresh take on the usual Christmas citrus. You wouldn’t be happy missing out on Paul’s multi-award winning salted caramel, so there is one of those too. And in store there is also a seasonal reinvention of the famous brownie, a Plum Pudding Brownie. Fudgey, crisp chewy edges, Christmas pudding fruit and spice, there is nothing I don’t love about it! 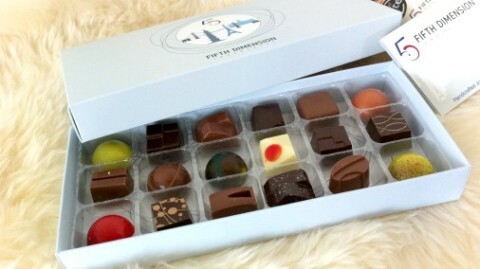 My main recommendation when buying chocolate gifts, is simply to buy great chocolate. Never compromise, just because a package looks good. So I also always give gifts of good origin chocolates that I love all year round. Original Beans make consistently delicious chocolate, and plant a cacao tree for every bar. That’s a nice extra thing to be giving. 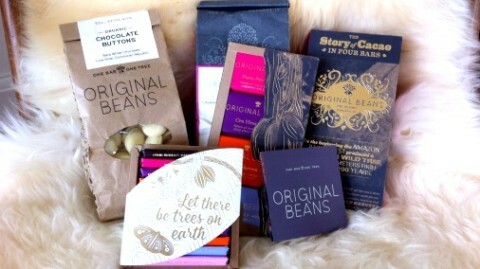 The perfect new stocking filler from Original Beans. 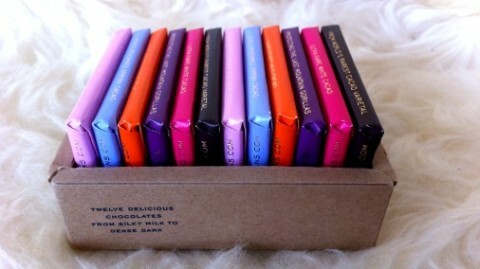 And these new mini-bars are such a perfect stocking filler. From old favourites to new. J Cocoa, a new bean to bar outfit in the West Sussex, are having a breakthrough year. And I love these little chocolate buttons! 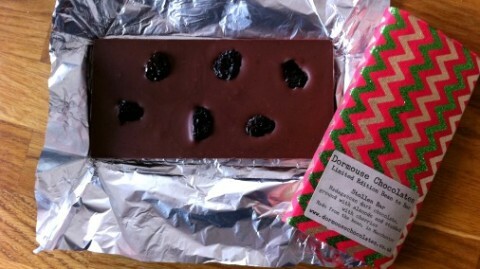 Dormouse Chocolate’s limited edition bars. 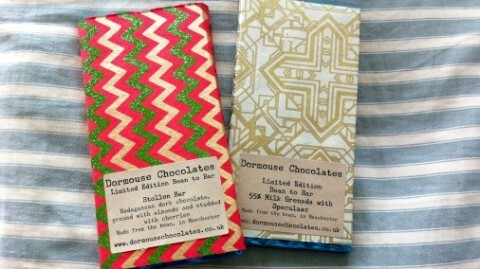 Dormouse Chocolates, who I wrote about earlier this year, have two seasonal bars that are spot on. They are limited edition, created in a small quantity. 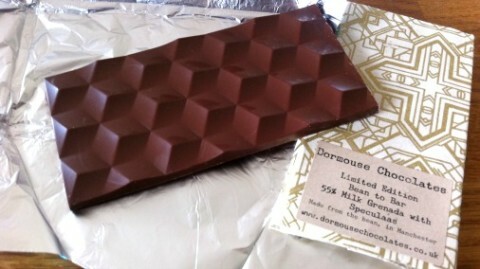 They are also launching a bar of the month club with these limited edition bars, which would make a fantastic present. Because they are a micro-batch maker subscriptions will be limited, and the lucky few will receive either a new origin bar or a new flavour. Contact Dormouse for more details. The Speculaas bar combines a creamy 55% Grenada dark milk with warming speculoos spices, redolent of those lovely caramel/spice biscuits, and dark toffee notes. The Stollen bar reveals its secrets. The Stollen bar, studded with the plumpest of raisins, is full of the flavour of raisins, currants, roasted almonds, red wine and hazelnuts. It has a long, clean aftertaste, super indulgent and delicious. 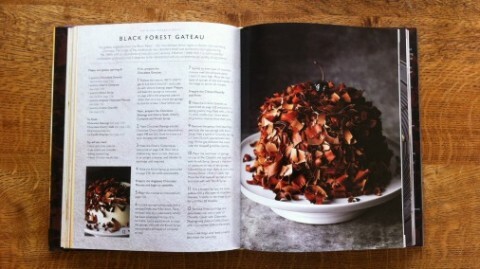 Nostalgic Delights – William Curley’s new book of gorgeousness. Of course the food present that keeps on giving is a recipe book; with its promise of many treats to come. If you are lucky you might even benefit from some of the output. And you would be lucky indeed if you were created anything from William Curley’s sumptuous new book Nostalgic Delights. Page after page of utterly tempting reinventions of our favourite treats have had me planning what to make and when. Some are certainly best kept for a day you have plenty of time to devote to happy kitchen time. But there are some simpler cakes, and his instructions for basic preparations are so useful and well set out. A delight. Sensational Chocolate! 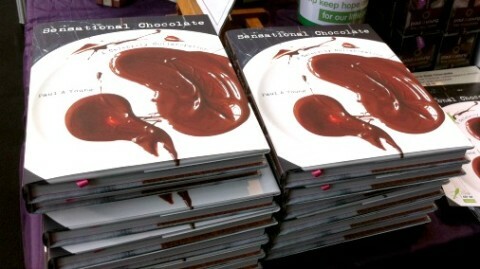 Buy multiple copies; lots of presents sorted & donating where it counts. And to repeat an entreaty from my last post, there are so many reasons to buy Paul A Young’s new book Sensational Chocolate. With wondrous chocolate creations from Paul and a host of friends and colleagues – Darcey Bussell, Emma Thompson, Edd Kimber, John Whaite – this is a yummy and easily approachable set of recipes. All profits from this book go to the Children’s Air Ambulance, which is an even better reason than all the wonderful treats it contains to buy multiple copies! And doing so spreads a little bit of true Christmas spirit at the same time.